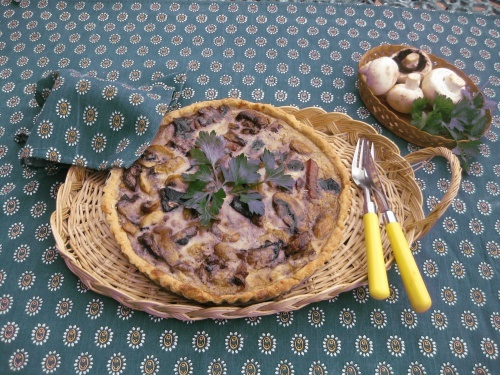 This is a mushroom and bacon quiche. For vegetarians cheese can be substituted for the bacon. Rub the fats into the flour, mix in the parmesan cheese with salt and pepper, and add just enough cold water to form a firm dough. Leave to rest for 10 minutes. Heat the oven to Gas 7/210C. Grease the tin. Roll out the pastry to line the tin or dish and prick the base with a fork. Press a piece of foil into the base and bake for 25 minutes, remove the foil and bake for a further 10 minutes then take out of the oven and reduce the heat to Gas 6/200C. Wipe the mushrooms where necessary and trim the stalks, slice the largest ones. The smallest can be left whole. Chop the onions. In a large frying pan fry in the oil for a few minutes. Remove the fat from the bacon, cut it into strips, add to the onions and fry 2-3 minutes. Add the mushrooms, sprinkle with salt and pepper, fry 2-3 minutes. Beat the eggs and yolks with the crème fraiche, a pinch of mustard and salt. Mix into the mushrooms then put all into the pre-cooked pastry. Put into the oven for 25 to 30 minutes or until firm and brown.